Tim Carter and Nolan Sheldon interacting with U-12 players at the opening module of the Academy Directors' Course, which focused on curriculum development for Zone 1 players at the Nike campus. The U.S. Soccer Development Academy and Coaching Education departments are integrated in philosophy and practice. As part of the collective belief that better coaches will develop better players, U.S. Soccer has created an exclusive leadership course for Academy club leaders. This course, called the "Academy Directors' Course," aims to improve, educate, and inform youth leaders from around the country of best practices and current trends in elite youth Academies. Academy Directors have various responsibilities as the leader of a Development Academy Club: structuring long-term vision and policy for their club, developing and implementing talent development plans, and improving the competencies of club staff, among others. The Academy Directors' Course is available to current Academy Directors that hold a U.S. Soccer "A" License. This course focuses on leadership in the Academy environment beyond courses focused on the coaching pathway. While there is a relationship between the coaching license pathway and the Academy Directors' Course, the intent is to provide further education that will help technical leaders develop additional skills off the field to improve the everyday environment in the club. The Academy Directors' Course centers around building an ever-improving Academy Director Profile, which is used to measure how and where Academy Directors can grow and develop. "The course specifically focuses on Academy Directors because he/she is leading an entire organization," says Aloys Wijnker, one of the Course Instructors and a Coach Educator at U.S. Soccer. "While coaches focus on developing a group of 16-18 individual players, the Academy Directors create bigger-picture strategy for the academy as a whole." Beyond the Profile, the course incorporates self-assessment and identifying specific needs for each candidate. "While some Directors are focusing on developing the level of their coaches, others may be concentrating on how to represent their academy internally or externally. Each candidate's individual needs can be different." While their target goals may be different, Aloys noted that a lot of Directors are struggling with the same issues. "Our meetings provide Directors with the opportunity to share formal and informal information with others, whether in meetings or during lunch. Our course is structured so directors to have time to ask each other, 'How do I solve this challenge?' and receive feedback." The course content includes webinars, guest lectures, various site visits, and training modules that address topics of academy culture, technical leadership, performance analysis, sports science, long-term player development, managing staff, and strategic planning. Each of these modules has a related site visit to observe various environments, including Youth National Teams, domestic academies, and international European academies. See below for the 2016-17 course outline. 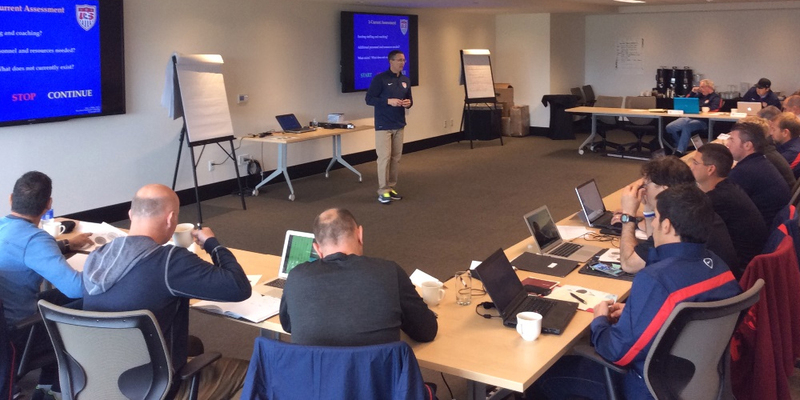 Guest lecturer, Dr. Greg Shelley, discusses leadership development education on how to coach coaches at the opening course module hosted at the Nike campus. The course is structured around an intimate group setting, where candidates can build relationships with others in the course, including mentors, instructors, and other Directors. Each candidate is assigned an experienced mentor, who meets with the candidate in between meetings to discuss strategy, receive feedback, and share ideas related to projects from the course. These relationships extend beyond the course's duration, and aim to provide Directors with nationwide resources and contacts. The 2015-16 course had 18 participants, and we congratulate all candidates on completing the course. The 2016-17 course begins this Tuesday, August 16th, and will include 19 participants as part of the third cohort to undergo the Academy leadership course. Ultimately, the course fosters cross-country collaboration among club leaders and emphasizes the importance of collective effort to raise the level of everyday club environments in American soccer. "The course tries to the create the USA team feeling," says Aloys. "We want to develop world class players, and for that to happen we need world class environments and world class academies."